We have more from the floor at the fifth-annual Dwell on Design conference at the Los Angeles Convention Center. Here we present a few booths that caught our attention. Artist Parvez Taj had a booth near the entrance and was showing his work, which includes prints on canvas, aluminum, mirror, glass, acrylic, bamboo, and reclaimed wood. Unison was back at Dwell on Design with a booth made colorful with a bounty of bedding. 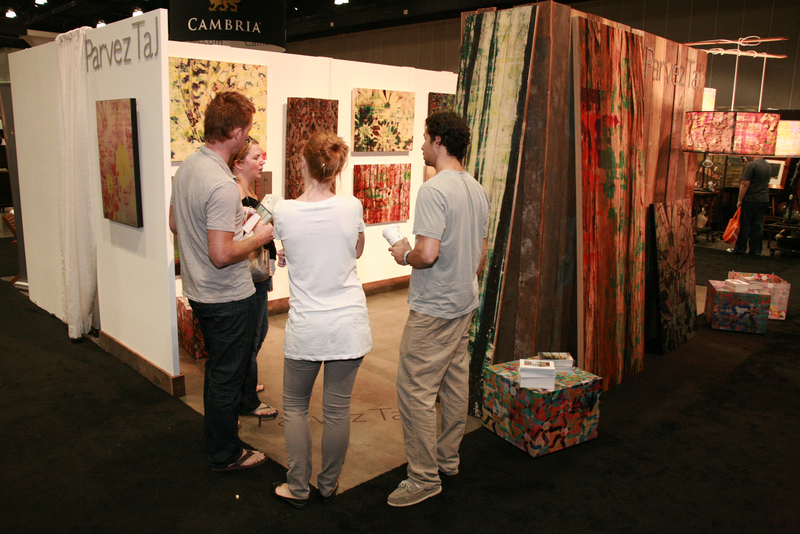 The Chicago-based company, launched in 2006 by husband-wife team Robert Segal and Alicia Rosauer, were one of many exhibitors selling their wares on the show floor with the cash-and-carry program. Dallas-based company LOFTwall turned heads with its bright yellow wall divider on display. Ventless fires have gained more and more popularity and Brasa showed off its portable fireplaces on the show floor. Posters of the finalist designs for the Kohler Water Wise competition were on display in the Water Wise Gallery. Stay tuned for the contest winner to be announced on dwell.com. The Dwell Store included retailers Skylight Books and A+R. Also on sale were the Taylor Stitch x Dwell Architect's Shirt and Pierrepont Hicks x Dwell Bow Tie as well as the 10 x 10 Dwell and Arkitip special edition prints. Gilt Home set up a comfy couch zone filled with Ligne Roset Togo sofas. Vapur's water bottles were selling at the Dwell Store like hot cakes. The reusable bottles can be rolled, folded, or flattened and were available in a range of fun colors. Project H joined us to display products designed for social good. Founded in January 2008 by Emily Pilloton, Project H promotes designs for the wider good and is currently headquartered in North Carolina working with the Bertie County School District on a one-year high school design/build program. Gus*, a Toronto-based furniture company, showed off its pieces in the Hold It Contemporary Home booth. The furniture prides itself of it's upholstered seating made with 100-percent FSC-certified wood and sustainable practices. Pedini, an Italian kitchen design company that produces modular kitchen systems and cabinets, had its Lamborghini fabric on display. In the Environment booth, artists worked through the weekend adding their creative touch to unfinished bookshelves.